Get ready! Here comes Kodable 2.0! August: the month that leaves us saying goodbye to summer days, seeing the sun drop a little earlier, and gearing up for back to school with pencils (and iPads) in hand. What’s different about this trip around the sun? This August is the month of Kodable 2.0! That’s right, we have been working on epic changes and new features that we are ready to unleash! Over the past year, Kodable has gone from an app that teaches coding to a complete K-2 coding curriculum, but that’s only half of our mission. With that said, we are SO excited to announce Kodable 2.0. This month will kick off a wave of Kodable updates over the coming months that will bring us closer to our goal of becoming the first K-5 programming curriculum. 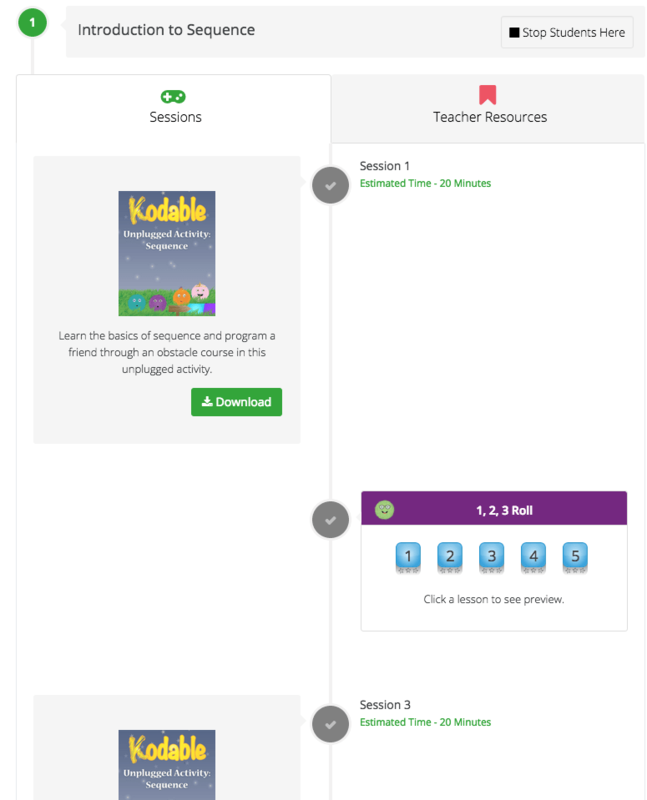 A Curriculum Playlist is a Scope and Sequence of the Curriculum content in Kodable. Curriculum Playlists allow you to control what portion of the Kodable curriculum your students see and use on their devices. This means you can customize what your students have access to by hiding lessons and customizing where each class starts and stops in the Kodable curriculum. All edits in the Curriculum Playlist can be adjusted as needed and immediately appear on your students’ devices. Students have led their fuzzes through the technomazes of Smeeborg, gathering enough knowledge and resources to enter another world. As they leave Smeeborg to explore the universe, the fuzzes will be met by a vast asteroid field that needs navigating. 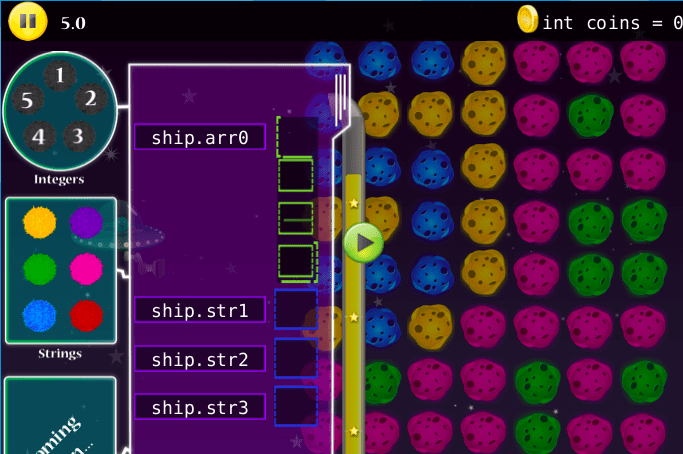 In their spaceships, fuzzes will use colors (strings), numbers (integers), and groupings of colors and numbers (arrays) to break through walls of asteroids in each lesson. Asteroidia’s units introduce concepts that are developmentally appropriate and put students one step closer to writing code by 5th grade. syntax- the rules in programming language that define how functions and commands are arranged and carried out. variables– A variable is a container for information. Like a jewelry box holds various types of jewelry, variables in programming contain different kinds of information. Variables form the bridge between the foundational coding concepts we teach in Smeeborg with higher level concepts like object-oriented programming (coming soon!) that will enable students to directly read and write code. We had the pleasure of visiting 60+ classes on our Kodable Road Tour this past spring. We learned how hard it is manage a class of 20 or more students with half of them needing help at the same time. Our improved student login process is based on the experiences we had and input gathered from teachers on our road trip. We want to eliminate the chaos associated with getting students signed in, and our improved Student Login process gives students and teachers an intuitive, kid-friendly login experience. We hope that you’re just as excited as we are about taking coding in the classroom to the next level! As always, reach out with feedback and questions, we love hearing from you! Stay tuned for more exciting updates, releases, and new features throughout the back to school months! Next PostNext Curriculum Playlists: It’s About to Get Personal!